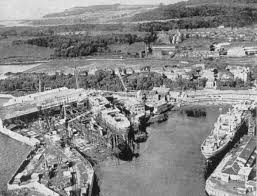 A 1958 image from the air of the Burntisland Shipbuilding Company of Scotland (1918-1968) where the Uskbridge was built in 1940. Founded by Amos and Wilfrid Ayre, they built 310 ships. The British steam ship Uskbridge was built in 1940 by Burntisland Shipbuilding Company, Burntisland West Dock, Scotland, across from Edinburgh. Her keel was laid on the 21st of September 1939 (weeks after the start of World War II), she was launched as hull number 236 on the eighth of April 1940, and delivered on the 22nd of June that year. The ship weighed 2,715 gross tons and could carry 4,500 deadweight tons of cargo. Her dimensions were 324 feet in length, 45.2 feet in width and 20.6 feet in depth. The ship’s owners were the Uskport Steamship Company Limited of Newport, Wales, which was a subsidiary of Richard W. Jones and Company, Dock Street Newport, Monmouthshire. Usk is a town roughly 14 miles northeast of Newport after which all three other ships in the fleet (Uskside, Uskmouth, Uskport) were named. In October 1940 the Uksbridge loaded 4,000 tons of anthracite coal to be discharge in Montreal, Quebec, Canada that fall. She loaded in Swansea, Wales, and proceeded to Liverpool to the north in order to join a trans-Atlantic convoy. On her first and final voyage the Uskbridge sailed in Convoy OB 228 which departed Liverpool, England on Sunday the 13th of October, 1940 and dispersed four days later, on Thursday the 17th. According to the Arnold Hague database, the convoy consisted of 40 merchant ships and four naval escorts. Of these the Bonheur (British, 5,327 tons) was sunk by U-138 under Wolfgang Lüthon Tuesday the 15th, and the British Glory (British, 6,992 tons), was also torpedoed by U-138, however it was towed back to the Clyde River, Scotland. There were 29 men aboard the Uskbridge on her maiden voyage to Monteal, all under the command of Captain Wilfred Breckon Smith, aged 43, supported in part by his Second Officer, Frederick John Bettridge, aged 25. In the early morning hours of Thursday the 17th of October the Uskbridge was roughly 180 nautical miles south of Iceland, 300 miles northwest of Scotland’s Outer Hebrides, and 2,535 miles northeast of Bermuda. It was a “fine moonlit night” though doubtlessly cold in October. At 3:39 am German time (about 2:39 am ship’s time) Kapitänleutnant Claus Korth in command of the German submarine U-93 fired a G7e-type torpedo into Convoy OB 228, not sure exactly where it would detonate. In fact it missed his intended target and hit the Uskbridge on the starboard side instead. Because the impact was most felt beneath the ship’s bridge, or wheelhouse, where Captain Smith and Second Officer Bettridge were standing, they were both killed. The Chief Officer was also on the bridge, but managed to survive. 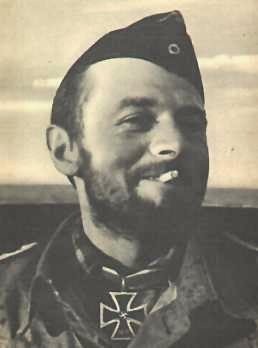 Kapitänleutnant Claus Korth, whose attack on Convoy OB 228 led to the sinking of SS Uskbridge on the 17th of October, 1940. According to one witness, the starboard bridge wing was sheared off and the torpedo blew a hole in the side of the Uskbridge “big enough to drive a bus through.” Survivors related that the water thrown up by the explosion reached as high as the vessel’s main mast. Water swirling around on deck and through the passageways in the ship’s accommodation areas made some of the sailors think that their ship was already doomed, however it stayed afloat for many hours. There was enough time for the 27 survivors to get away from the Uskbridge in two boats. There were ten men in one boat and 16 in the other. A quartermaster, who had been steering at the time of impact, had his face badly cut by flying glass. The Chief Officer had apparently been blown off the bridge and was fortuitously retrieved from the water by another ship, probably on account of new flashing red lights worn on life vests which were equipped with waterproof batteries. The men in one of the boats agreed to return to their stricken mother ship in order to look for Captain Smith, the missing Chief Officer, and Second Officer Bettridge. Though they did indeed return to the steam ship at great peril to themselves (their rescue ships in the convoy were plodding away and U-93 still lurked in the area), they could find no trace of the missing men. Because the engine room had not been hit, the Uskbridge’s lights were still on. Six of the men in one of the lifeboats were taken aboard the ship Montreal City, a 3,066-ton British steamer built in 1920 and owned by Charles Hill and Sons, Bristol – across the Bristol Channel from Newport, where the Uskbridge was registered. Presumably they were taken to Montreal, where the Uskbridge was destined. The 21 men left in the Uksbridge’s lifeboats were picked up by another ship in the convoy, the Dutch steamer Katwijk. Built in 1921 this 1,589-ton steamer was owned by the Erhardt & Dekkers firm of Rotterdam. She was 253.5 feet long, 38.2 feet wide, and 16.11 feet deep. 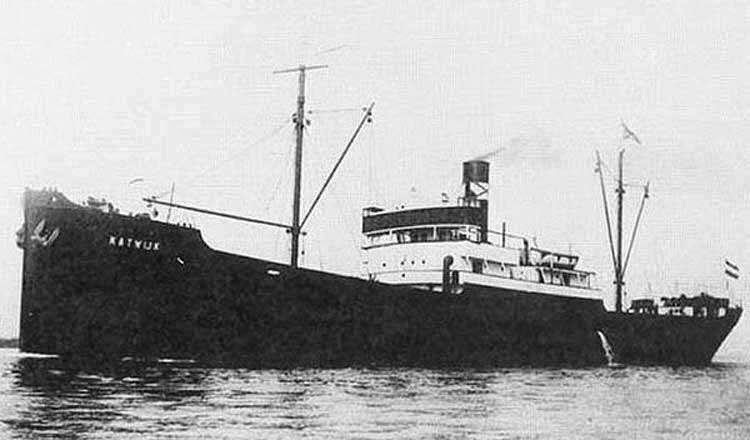 S.S. Katwijk, the slow-moving Dutch steamer which rescued 21 men from the Uskbridge on the 17th of October 1940 and transferred them to the larger, faster steam ship Cristales for a passage to Bermuda. Badly disabled, Uskbridge straggled out of the convoy and U-93 was able to catch up with the stricken vessel ten hours later. At 1:36 pm Korth sent a second torpedo, this one a coup de grâce, into the Uskbridge, and she quickly sank. At some point, perhaps when the ships were safely clear from the immediate danger or torpedoing, the Katwijk’s master transferred his 21 charges to the steamer Cristales. This may have been for a number of reasons: insufficient food and accommodation for the extra passengers, a destination which did not suit the survivors – the reason is not given. 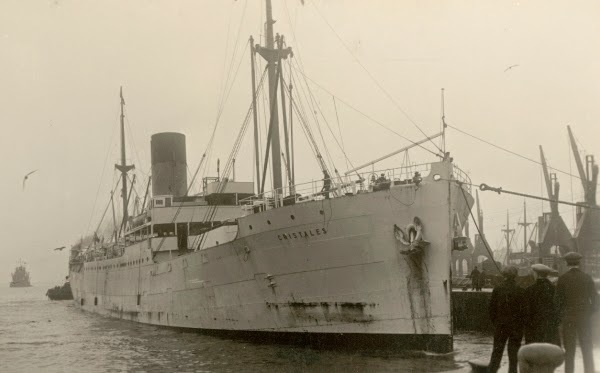 A well-balanced image of the fast steamer S.S. Cristales, which took on the 21 survivors of the Uksbridge who had been retrieved from their lifeboats by the Dutch ship Katwijk. Note the men standing in the right foreground, the cargo derricks to the right, the stained anchor and the tugs off to the left and behind the ship, emitting exhaust. It looks from the deadeye on the mooring line forward that the hawser which is to tie the ship to the dock is still being pulled in via a lead-line to the ship’s bow, indicating that the Cristales is still actively engaged in docking when the photo was taken. There is even a small bow wave to substantiate this. The Cristales was a 5,389-ton steam ship built by Cammell Laird and Company Limited, Birkenhead, England in 1926. Her owners were the Elders and Fyffes Limited firm of Covent Garden, London, and her homeport was Liverpool. The ship’s dimensions were 400.3 feet long, 51.5 feet wide, and 26.9 feet deep. She was capable of an impressive 13.5 knots, which may have been another reason why she was transferred from the 8.5-knot Katwijk – she could get the survivors to safety considerably faster than the Dutch ship could. The Cristales arrived in St. George’s, Bermuda on Monday the 28th of October, 1940, after a passage of roughly 12 days (depending on where and when she picked up her 21 passengers from the Katwijk). Cristales’ Master in May 1942 was Captain Hugh Roberts, however it is not certain whether he was her skipper at the time of the Uskbridge rescue or not. A local reporter wrote that “Upon arrival here, the crew were brought to the Sailor’s Home by a special train,” indicating that they were most likely landed to the northeast, in St. George’s and taken by the Bermuda Railway to Hamilton. Once in Bermuda the officers were separated from the men, as was customary, particularly in British colonies and on British ships, at the time. 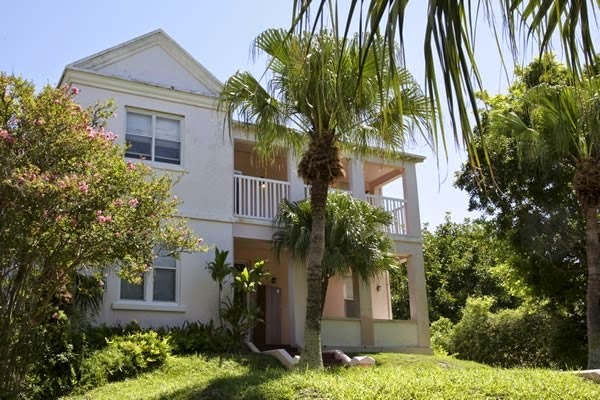 The 16 sailors and engine room staff were accommodated at the Bermuda Sailor’s Home and the five officers were put up at a private home named “Gladwyn,” listed in the present day as a residence of the King Edward VII Memorial Hospital. A home in Hamilton, Bermuda named “Gladwyn,” which is (presumably) the same building where five officers of the Uksbridge were accommodated in Bermuda in late October and early November 1940. It is listed as a residence of the King Edward VII Memorial Hospital. 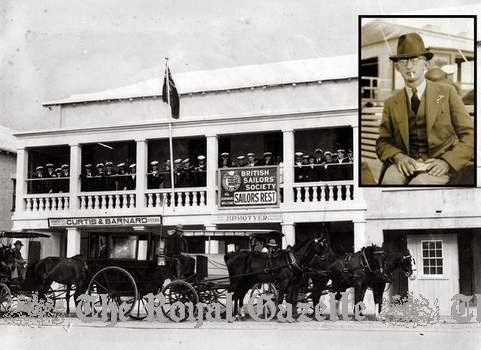 A reporter for the Bermuda “Royal Gazette & Colonist” visited the Sailors Home to interview some of the men and officers. They caught some of the sailors inside playing billiards and others “out on the gallery.” The 21-year old Third Officer spoke with the reporter, as did a member of the bridge watch when the Uskbridge was first struck. Mr. L. N. “Dickie” Tucker, founder of the Bermuda Sailor’s Home and the home itself, in Hamilton. This photo was taken during a funeral procession for merchant sailors killed while on duty and landed in Bermuda during World War II. The Cristales was torpedoed in Convoy ONS 92 south of Greenland by U-124 under Johann Mohr on the 12th of May, 1942. All of her complement of 82 merchant mariners, gunners and passengers were rescued by HMCS Shediac (K 110) as well as USCGC Spencer (WPG 36) and landed at St. John’s Newfoundland and Boston Massachusetts respectively. The Montreal City, under Captain Edward Roylands Wolferstan Chanter, which rescued six of the Uskbridge survivors, was subsequently sunk by U-591 under Hans-Jürgen Zetzschesouth of Greenland and east of Newfoundland on the 21st of December, 1942. The Katwijk was renamed SS Etna in 1954 and ran aground and was wrecked in Scotland on the 19th of January 1954. Over his career Korth (later Korvettenkapitän) sank a total of 13 ships of 54,584 tons, as well as a warship, another ship damaged and another a total constructive loss. For this he earned a place on Uboat.net’s “Top U-Boat Aces” page. Claus Korth survived the war, having moved to training positions ashore in 1942. He spent six months as a POW in Allied captivity. Between 1955 and 1970 he returned to the Bundesmarine – Germany’s post-war navy. He lived until the age of 76, passing away in Kiel in 1988. Brown, Warren, Captain, email to author in May 2014 regarding the Sailor’s Home.